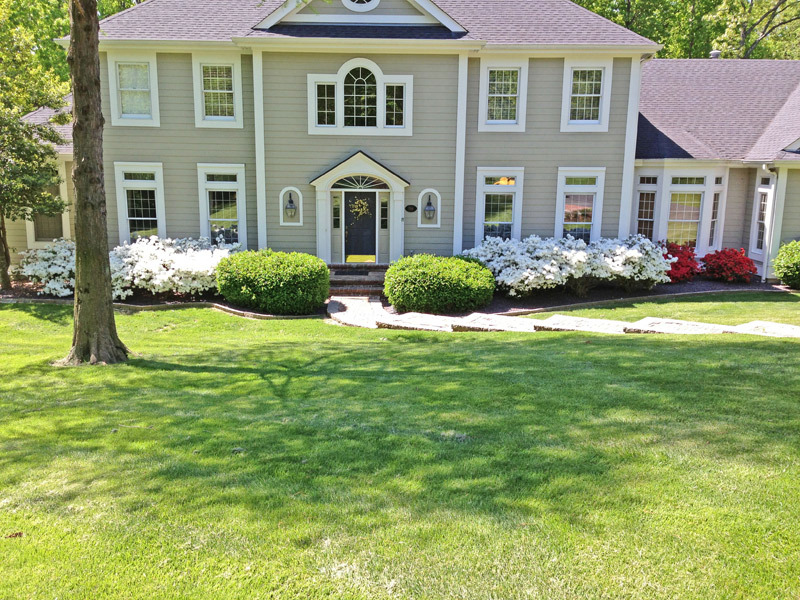 Our 30-year-old Chesterfield home is gorgeous when the azaleas bloom. However, during the rest of the year, the front of our house seems boring and outdated with the overgrown shrubbery. As much as I hate to part with our faithful bloomers, it is time. 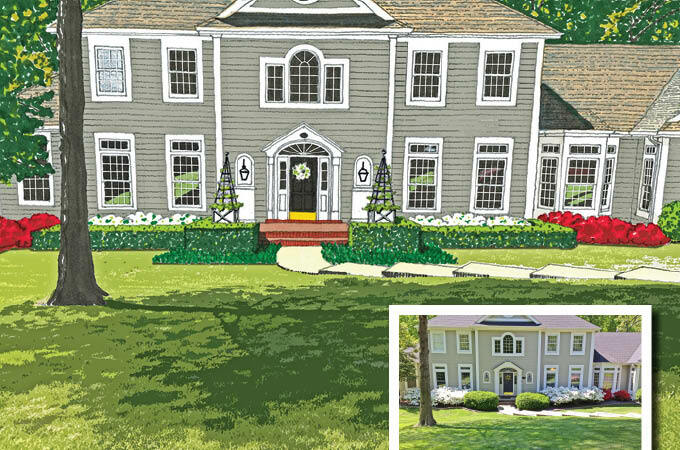 Please help us give a new look to the front of our home. It can be very difficult to figure out how to alter plantings that look so spectacular for a month or so with something that offers a better year-round aesthetic. 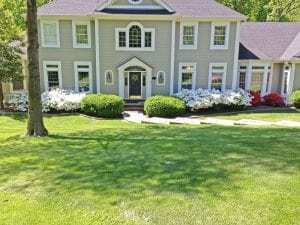 Your springtime photo looks great, but your winter photo (not shown) shows an overgrown drabness that I think we can fix without doing away with the azaleas. In fact, I’ve added more! First, I would suggest bordering the white azaleas with a low yew hedge. The yews have a rich, year-round color that will hide the azaleas’ winter brown. I also would clip the azaleas to the first-floor windowsills to allow the transom windows to appear as tall and elegant as possible. Next, shape the boxwoods on the front landing into a more formal, rectangular look, and underplant them with liriope or ivy. On the landing, place two Versailles boxes with pyramid trellises accented with climbing vines for spring and summer. The bold outline of the trellis will look fine in the winter when the vines die back. 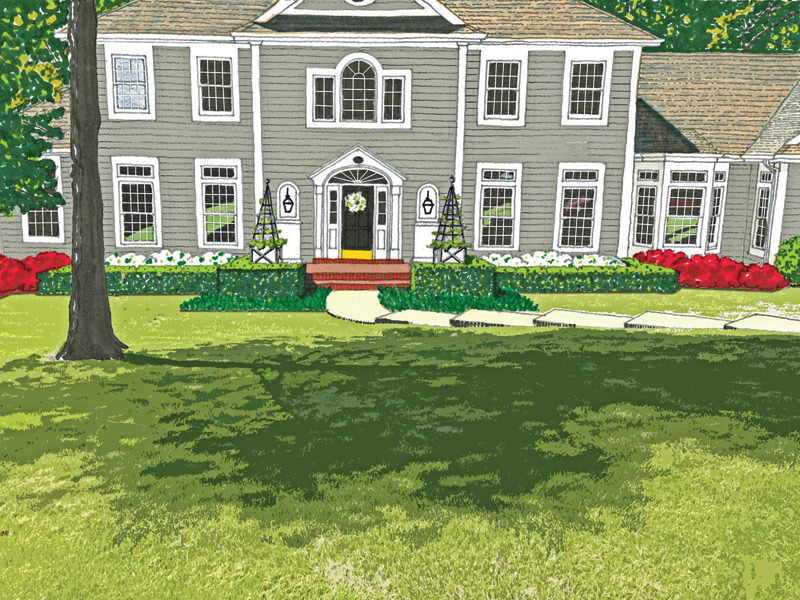 For a final jolt of color, plant bold, red azaleas on the other side of the main body of the house for better balance. I also have adjusted a few details at the entry. The arched lamp outlines now have bases, the sidelights on the front door are repainted in white, and the oval address plaque is now centered above the door. These changes should yield a more architectural, evergreen look in winter while celebrating what already looks great in spring.